Do you love Dare-Up-Your-Party, its content, the truths, dares, stories and videos? Well, I sure hope you do! But if you wanted to become a real member of this website and are looking to "sign up" for the website, this does not exist - yet. But we have three different levels of Truth or Dare memberships and involvements to this website. The first one is a must-to-do if you like us and are a fan of us. You have to subscribe to our newsletter. And you will get a free EBook with 120 Dare ideas, no strings attached. and what we will send to you? I try my best to send it once a month, but sometimes I might be late a day or two. But one newsletter a month is what you can expect. What is in the monthly newsletter? The "Truth or Dare Magazine" sends you the most important new stuff from the website which is growing day by day. Also if there is some unique stuff I want to share with you, I will put it in the newsletter. And you don't have to worry about missing old issues because we back up the most important newsletter magazine mailings on a special page which you will be able to see when you are a subscriber. I promise to use it only to send you Truth or Dare Magazine. The second level of involvement is our email alerts. Subscribe to our email alerts! Just paste your email down in the form right now. Well there is also a third level of involvement and that's to send us your comments or submit your stories, but that's not all. After all comments you will have the possibility to sign up via email to the comments now we are talking. At the bottom of every post you will see a link where you will be able to add your own comments, but when you find your comments after you submitted, you will get a page like this. 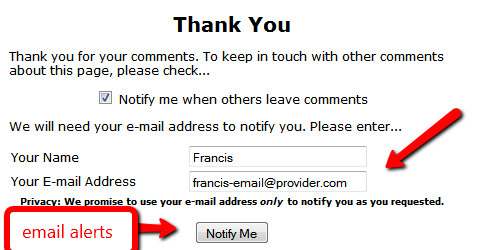 Please leave us a comment here or anywhere else where you can see a link to write your comments and after you have written your comments, you get a little "Thank You" page with the option of notification via email. If you do that you will get an email for all other comments on this webpage. That's the deepest way to get a Truth or Dare membership of this page of this website because you will see which post gets feedback from other people, your friends and other visitors. Thus you can follow the links in the emails to the posts that are commented on. Also comments show up live after a few minutes after you typed them in. you might have to refresh your browser, but the comments will be there and as a post to the submissions they will not have to be published after being reviewed by me. Off course if you have a story, feel free to send us your Truth or Dare story. If you send is to us it to us you will also get a little Thank You and don't forget to scroll down and leave us your email address in this form too. Because you will get an alert when someone comments on your story. Remember, when you tell us your story and we publish it, it becomes its very own webpage. Your webpage! You can send it your friends, get liked it on the Facebook, everything else you can do on your own website without having a hassle to do your own website. That's the best way to become a member, a contributing member to this community here or "Truth or Dare." Oh, did I say there are only three ways to get in contact with us? There are many more ways to get a Truth or Dare membership on this website. You can also follow us on Twitter and see what we are up to? But the most important one I guess is the newsletter and the email alerts So sign up to the newsletter and you get free EBook with dare ideas and who doesn't like that. Also the E-Book comes up with nice Truth or Dare Pictures. So I guess that's something to look out for if you like eye-candy. Do you want more community? Community starts with you. You are what make the community. Each person that makes a contribution to this website is a part of this Truth or Dare family. Of course things are a little bit rough here because Dares are noting for pansies but it will be sure to grow and be fun. So join us now and be part of something special.